Abstract: Identification and quantitation of steroid metabolites in biological samples are essential for screening for various hormonal disorders. Many of these metabolites are closely related isomers and cannot be easily separated by LC or one-dimensional GC due to their chemical and structural similarity, which complicates or even prevents reliable analyte assignment. Comprehensive two-dimensional gas chromatography (GCxGC), coupled to a high resolution high mass accuracy time-of-flight mass spectrometer (HR-TOFMS) provides dramatically enhanced chromatographic separation, an increase in sensitivity, and reliable detection and identification of analytes of interest. Thirty-three steroids from different classes (progestogens, androgens, estrogens, glucocorticoids, mineralocorticoids) were derivatized and analyzed using GCxGC coupled to HR-TOFMS to achieve detection and reliable identification in complex matrices. Summary: -AML library was created by running individual derivatized steroid samples. -GCxGC Method was developed allowing reliable separation of all 33 steroids in the sample. -All 33 analytes were found in the mixture and positively assigned using accurate mass confirmation for molecular ions (when available) and major fragment ions, RI, and AML/NIST library matches. 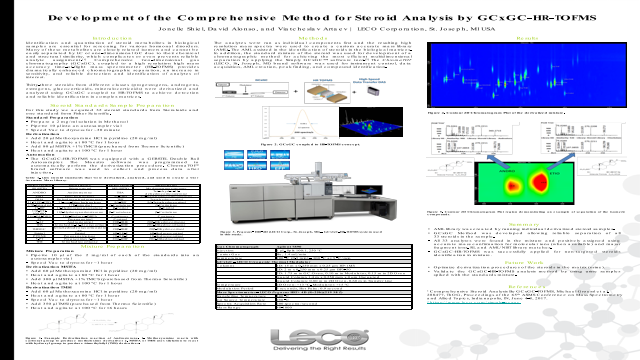 1 Comprehensive Steroid Analysis By GCxGC-TOFMS, Michael Groessl et al, 288477, ThOG, Proceedings of the 65th ASMS Conference on Mass Spectrometry and Allied Topics, Indianapolis, IN, June 4-8, 2017.